A few weeks ago, my baby turned four. Of course, I really shouldn’t call my four-year-old a baby, but as he’s my youngest I’m allowing myself a little creative license. Those four years have gone by awfully quickly. He was only a few months old when my daughter was diagnosed with Coeliac Disease and was the most placid of babies. Now he is a blustering, rambunctious chatterbox who is more than a little ready to take on kindergarten. For their fourth birthdays, all of my kids have had their first kiddy party. On this occasion, we decided a jumping castle would be the go. That would make it a nice, easy, simple party with some nice, easy simple party food to match. Right? With gale force winds forecast on the day of the party, we had to do some quick thinking. I had awful thoughts of the castle blowing away with a bunch of kids clinging on for dear life, so the castle was cancelled. With 24 hours’ notice, I set about rethinking the whole party and settled upon good, old-fashioned party games as the entertainment. It was at this point that I made a surprising and very happy discovery. My two girls, aged 9 and 8, proved helpful beyond measure. I’m not talking about the okay-I’ll-let-you-help-me-just-to-humour-you-even-though-I-will-have-to-redo-everything-later kind of helpfulness. I’m saying that I actually couldn’t have done without them. I never really thought I’d ever get to that point as a parent. I think it might have been a watershed moment. While I was locked in deep panic, I had my eldest on the internet looking for party games while my other daughter carefully stuffed party favour bags. (I’m going out on a limb here and declaring that for me, this will now mark the end of that widely practised mummy ritual of stuffing lolly bags at 2 in the morning, just hours before the party). Then we shopped for prizes and gifts for the party games, as well as extra lollies and chocolates…. just in case. Finally, my girls made the little teacups you see in the picture above. I make no claim to have invented this recipe – it’s been around for ages – but I wanted to post it as I worked out a way to replace the gluten Tic Toc biscuits with gluten-free pastry rounds. I piped a little bit of icing left over from the birthday cake onto each round, made up a paste using icing mixture and milk, and then left my girls to do the rest. They did a pretty great job, don’t you think? It goes without saying that there were no leftovers. The tea-cup recipe comes from Sweet Surprises by Cherise Pagano. And I should also make mention of the cake. The best ever cake for someone like me. 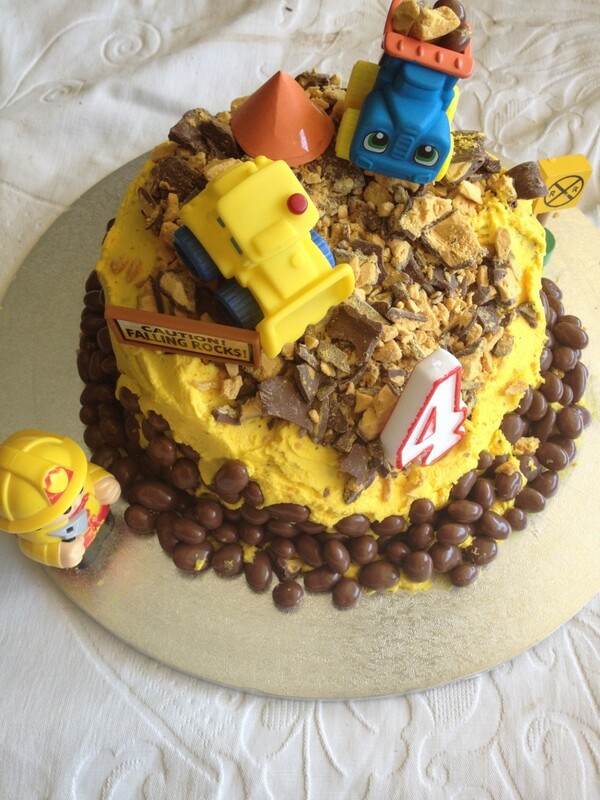 Frankly, I am more than a little slap-dash in my approach to cake decorating, so the Construction Site Cake was perfectly suited to my “skills”. (Australian Women’s Weekly Kids’ Party Cakes Cookbook). The kids loved it. 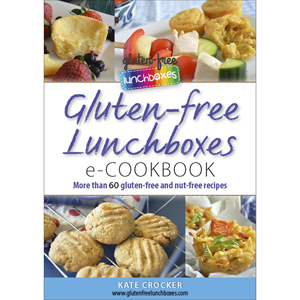 So did I – it was easy to adapt to gluten-free and so quick to assemble. I wonder if I can convince my son to have it for every birthday? Preheat oven to 180° Celsius (conventional oven) or 160° Celsius (fan-forced oven). Grease and line a large baking sheet or tray. Defrost pastry according to packet directions. Dust a clean and dry surface with the flour. Kneed and roll out pastry according to packet directions, to a thickness of approximately 3 mm. Using a 48 mm scone cutter, cut rounds from the pastry and put rounds onto tray. Bring scraps together and roll out again. Cut out more rounds. Repeat until all pastry is used. Bake for 18 minutes. Allow to cool completely. In the meantime, beat butter in the bowl of an electric mixer for 2 minutes or until pale. Sift in 1 cup icing mixture and add a few drops of yellow food colouring. Mix well. Pipe or spread a small amount of icing onto each pastry round. In a small bowl, make a thin paste using ½ cup icing mixture and 1 tbs water. Mix well. 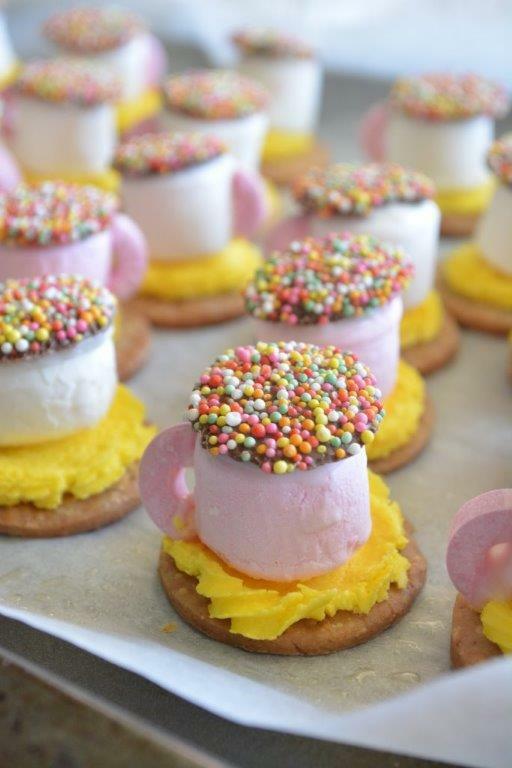 Assemble the teacups by placing a marshmallow on top of each iced pastry round. Dip the ends of each lifesaver half into the paste and stick onto the side of each marshmallow. Spread a little paste onto the back of each chocolate freckle. Stick freckles to the top of each marshmallow. Stand for 30 minutes to allow paste to set. I have never seen these tea cups. How adorable. You’re girls did a wonderful job! Welcome! Hope you find this site useful!